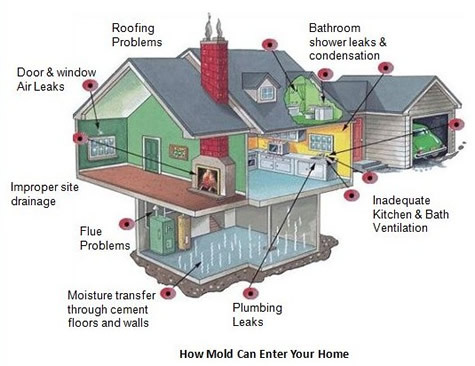 You already know that house mold is a serious threat to both you and your family, but you may also end up with irreparable damages to your house. The problem with mold is that it is everywhere. The air carries it inside, and if your house is not properly ventilated, it is a prime candidate for house mold colonies. Sometimes, you will never know that you have mold in your house until it is too late. 1. There is a stale and musty odor inside your house. 2. The stale and musty odor clings to fabrics you use at home – your curtains, linens and clothes – even when they have just been washed. 3. There are black and white speckles on various surfaces in your house, especially in areas near the water filter or the water softener tank. 4. There are crystalline substances present on your ceiling or in your basement. 5. The speckles and the crystalline substances keep reappearing no matter how often you clean them. 6. The cardboard items in your basement, attic or garage feel damp. 7. The wooden parts of the structure of your house are soggy. When you see any signs of mold in your house, it is important that you act upon it immediately. If you ignore your mold problem, you may be endangering the health of the people around you as well as running the risk of damaging your house. The experts at Smart Restoration Services can address your mold or other moisture-related home issues. We handle all phases of restoration, remediation and reconstruction. Contact us at 847.577.2900 or contactus@smartrestorationservices.com.